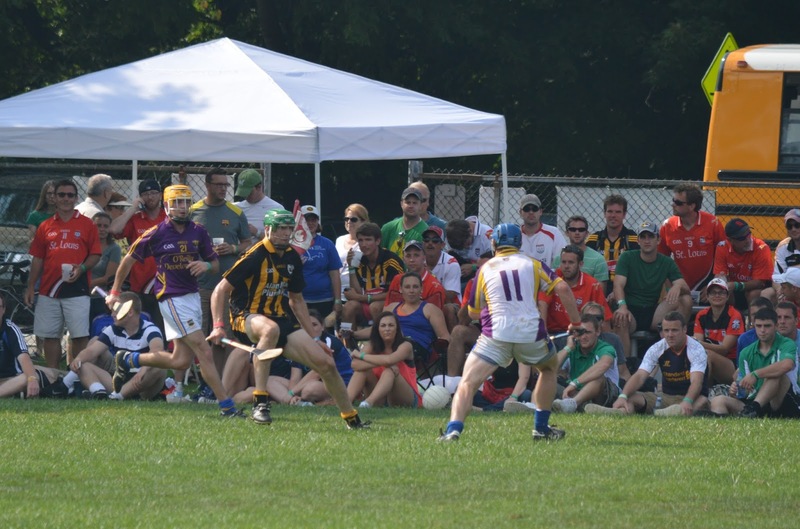 The Aer Lingus International Hurling Festival takes place the from September 18 – 21st as part of The Gathering – a drive to attract Irish exiles and descendants back to the homeland for at least a few days this year. Teams from all over the world were invited to take part in the tournament. 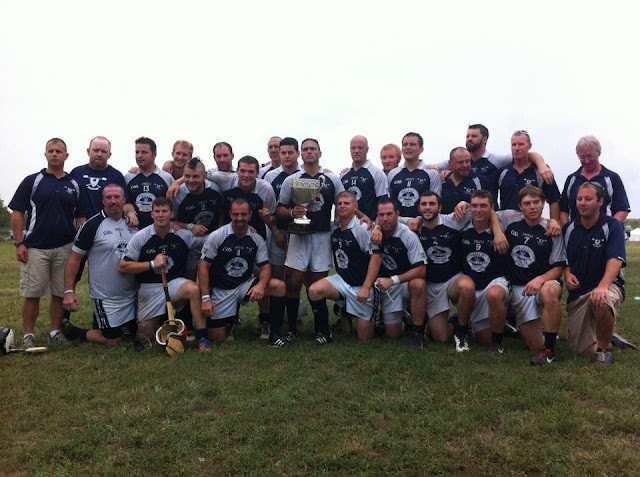 The Barley House Wolves, from Concord New Hampshire, are joining forces with Allentown Gaels from Pennsylvania to compete in the Non-Irish section where they will play for the title of World Champions in their category. By now the story of the Barley House Wolves has been well told. In 2005 a group of New Hampshire National Guardsmen returning from a one year tour of duty in Iraq stopped at Shannon Airport in Ireland on their way back to the U.S. and saw a game of hurling on the television. The idea of starting a hurling club to keep the lads together came up. Many had played either ice hockey or lacrosse and hurling allowed the soldiers who had spent a year in the line of fire to stay together with a game that combined the skills of the other 2 games. 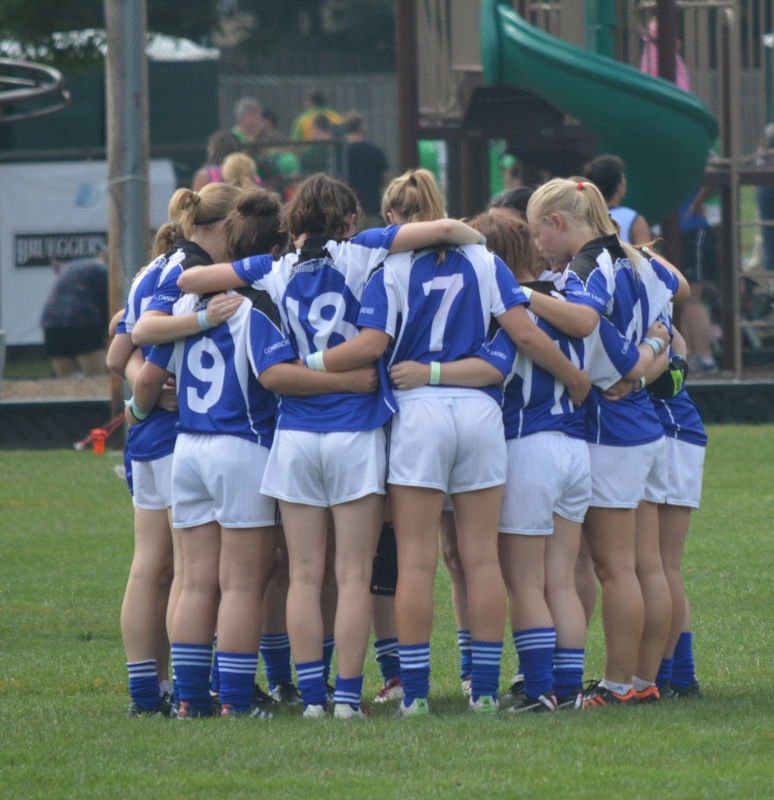 The Wolves started out in the junior C section of the Northeast division of the Gaelic Athletic Association. After reaching the national final in 2011, the Wolves won the championship in 2012 after beating their allies for the trip to Ireland, Allentown. The Wolves have now moved up to compete in the junior B division for the North American Championship. The Concord men also still field a junior C team that competes with 3 other clubs in the region, Portland Maine, Worcester Mass, and Hartford Connecticut. A traveling party of 20, including players, coaches, and supporters will depart for Ireland to play in the festival tournament. The players and traveling supporters are extremely excited to be going says manager and club secretary, Alan Mangan. Mangan, a native of Cork who moved to New Hampshire 2 years ago after spending 18 years in the Boston area is hoping to come back with a trophy to add to last season’s Northeast and NACB championships. The New Englanders will face teams from Buenos Aires Aergentina, a Denver/Indianapolis combination team, and a European team. Their division will feature non-Irish players only. Games will be played at pitches that feature prominently in the hurling heartland of Galway. First will be Castlegar to play Europe, next stop is Pearse Stadium to meet Buenos Aires, and then it is off to Tonabrucky to meet their fellow Americans, Denver/Indy. The top two teams will then meet in the final at the famed Pearse Stadium in Galway city on Saturday. Mangan is familiar with the other United States based opponents, Denver/Indy, and has done some research on the Argentinians, many of whom have played Rugby at a high level. The Europeans will be the biggest unknowns for the team from the Northeastern United States. The Wolves are bringing with them Olympic trainer, Stuart Kremzner. Kremzner is a professional trainer and has coached over 300 elite and professional athletes. The Barley House Wolves are listed on his Web site amongst Olympic, NBA, and NFL athletes. With a physical trainer of these credentials, and a band of extremely enthusiastic players from the towns of Concord NH and Allentown PA, how could you bet against these fellas coming back to the United States as the top team of non-Irish players worldwide? The Boston Northeast Board had 7 teams representing the division at the NACB finals in the Cleveland suburb of North Ohlmstead. The layout and organization was a credit to the Cleveland clubs who did a great job hosting the event. It was something new for much of the attendees, telling by the fold out chairs on the sidelines and chatting to some of the punters, it was a new thing for them to see live games of gaelic football and hurling. 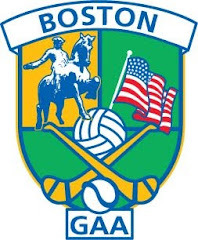 Of the Boston teams, the Wolfe Tones pulled off a win at junior A football, while the Connemara Gaels went down in a gallant display against Ulster from San Francisco, While Tipperary and Connacht Ladies lost out in their respective finals. 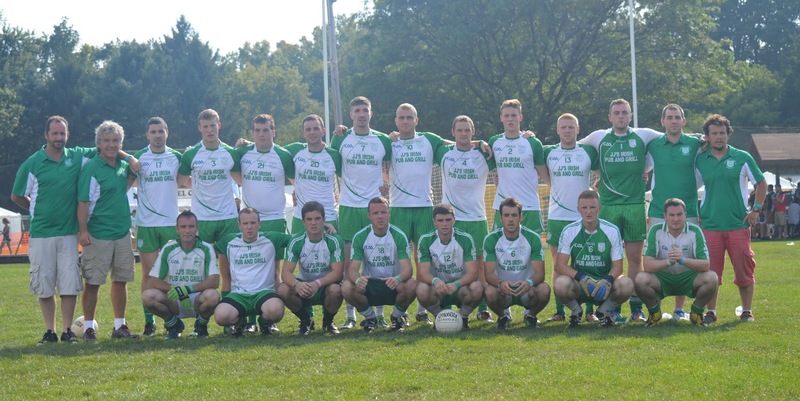 Having got a bye straight into the final, Wolfe Tones captured the men's junior A football trophy with a great display against the Patriots from Chicago. Leading by a goal at half time, the Tones made sure with a second goal in the second half and brought the NACB junior A football championship trophy back to Boston for the first time since Aidan McAnespies in 2009 when the finals were last held in Canton*. With the game close in the first half, Lee Carr fired the ball home to provide the lead to the Tones. With Ger Molloy his usual industrious self at center forward, and Carr motoring in the corner the scores came from Carr, Gary Leonard and Collie Carr stepped up from center back to float one over the bar. Aodhan McEnerney, still on a high following Dublin's win over Kerry earlier in the day put in a lot of work in the middle of the field, as did Kilcock man Gavin Walsh. The Philly side, made up of a lot of American Born players, though proved to be a tough nut to crack and hung on, matching the Tones for points. The Tones stepped it up in the second half to drive on to the finish. Sean Kelly on the wing created havoc for the Philly back line, and though he did not make the score sheet the wee man from County Down earned his keep. Collie Carr's second goal came with about 15 minutes left and having seen the Philly side chip a point or two off the Tones lead it was a breath of fresh air. Further points from Carr (Collie), Carr (Lee), and Leonard gave the Tones a nice cushion coming into the last 5 minutes. Try as they might to break the Tones defence for a much needed goal, the Philly side could not and there will be an extra passenger on the bus on the 14 hour journey back to Boston! Tones: C. Hynes, K. Gill, P. Collins, M. Farrell, C. Carr, C. Malone, G. Walsh, A. McEnerney, S. Kelly, G. Molloy, D. Egan, G. Leonard, L. Carr. Connacht Ladies get ready for the big game. 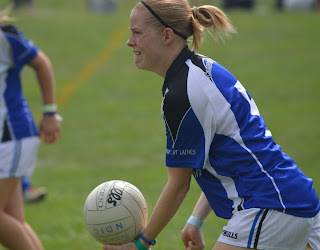 Captain Joanne O'Connell in action in the semi-final. The final was a different story as there was some controversy regarding the numbers of players. Connacht had come prepared to play 13-a-side and played the semi-final with 13, with one player togged out on the line. The powers that be decided that the game should be 15-a side and the services of Ciara Burns had to be called upon to make the 15th player. San Francisco were unwilling to compromise and insisted on the 15 a side game. Connacht were up against it from the beginning against a physically strong San Francisco team. The Boston team managed a goal from Ciara Donnelly, and Amy Ring put several frees over the bar, but by the time the break came the gap was 8 points. San Francisco piled it on the second half and rattled the net 3 more times. 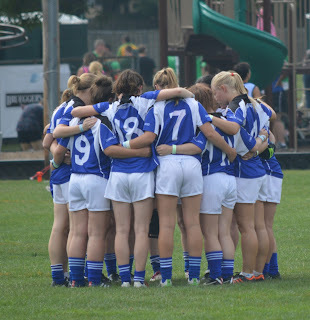 It was a tough end to the season for the Connacht girls, and maybe a lesson learned that the playing rules need clarification before teams make the journey to the finals. Connacht Ladies: C. Heraty, L. Burns, S. McAleer, G. Fields, M. Breen, J. O'Connell, A. Kerr, S. Brady, E. Byrne, A. McCloskey, A. Ring, F. Fallon, J. Ward, C. Donnelly, C. Burns, S. Mulkerin. The final was a heartbreaker for the Gaels, though it has to go down as one of the most exciting NACB football finals in the last few years. The Connemara men, who fielded 9 home based players for the game, ended up on the wrong side of a two point game, though they gave it their all. Players were moved around the field to get the get the maximum out of the team at different stages of the game. The Gaels ran their legs off and almost pulled it off, but it was not to be for the Boston side in the end. Having trailed at half time by 5 points the Gaels clawed their way back into the game and in the final minutes needed a goal to win it, but their exhausted legs could not breach the Ulster rearguard one more time. The first half started with the Gaels netting early after Robbie Kiely made a tremendus run down the middle of the field and buried the ball. Ulster had notched a point from star midfielder Caolan Daly. Daly proved to be the main man for Ulster in the middle of the field. The Tyrone man would remind you of Dublin's Michael Darragh McCauley the way he fielded and ran with the ball. Ulster pulled away late in the half. With the Gaels in a 1-3 to 0-4 lead, points coming from Noel Graham, Coleman Mulkerrin, and Graham again, Ulster scored the last 6 points on the trot. Center forward James Austin was involved in many of the Ulster moves and they moved the ball well. The Gaels had it all to do in the last 30 minutes. Ulster tallied the first score after the restart, but the Gaels lifted themselves to the full extent of their abilities. Tommy Sally pointed, as did Damien Doolan but then that man Daly netted for Ulster. The score put Ulster up by 7 points. The Gaels got it back within 3 minutes, a great move involving Kevin McGrath, Tom Sally, and a finish from Graham. Ulster's lead was back to 3 points, and Austin added another before Ulster got a penalty with less than 10 minutes to go. Eoghan Connolly pulled off a fantastic save to keep his side in the game and the momentum swung to the Gaels. Three points on the trot from McGrath (2) and Doolan reined Ulster in to a single point, but after the San Francisco side extended their lead to 2 with minutes left the Gaels needed a goal. The tired Gaels managed to get into the danger zone a couple of times but did not find the opening for a shot. Ulster were jubilant at the final whistle, the Gaels totally gutted. Gaels: E. Connolly, L. Cullen, C. Cullen, P. McNicholas, R. Kiely, D. Doolan, R. Hyde, T. McDonagh, S. Conneely, N. Graham, K. Owens, C. Mulkerrin, K. McGrath. Subs used: J. Purcell. 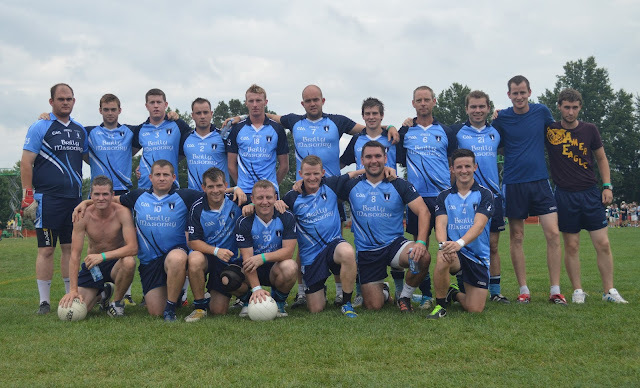 Tipperary arrived in Cleveland with a bye into the final, and without many of their players from the Boston final, and also without their jerseys. Tipp had to borrow the Wexford club's jerseys for the game. As it turned out the Boston champions fell to Na Fianna by 13 points, though it must be said that Tipp hurled well at times, even though they were 2 men down for most of the second half, and a man down for most of the first. Sean Moriarty netted early in the game, but soon after wards was shown a red card. Still 50 minutes of the game to go. Na Fianna got some great scores from free taker Sean Dowds, as well as Noel Kirby at center forward. The San Francisco lead was gradually built up but Tipp hung in there with additional points from Kevin Kelly, James Pender, and Neil Foyle. At the break it was 1-6 to 0-13 in favour of the western club. Not a huge lead to overturn, but with a man down the job would all the harder. The second half saw the second sending off, this time Pat Moriarty. Now with 2 men down it would be nearly impossible for Tipp to pull off the win. San Francisco kept the scoreboard ticking over, mainly from Kirby and Dowds. Tipp did the best they could with the 11 men and at times had the San Fran back line under pressure. Scores came from O'Donnell who had moved further forward, Pender and Foyle. Into the fray came Danny Egan, Cliff Malone and Kevin Hartnett and at that stage the result was in little doubt. Na Fianna have won 3 in a row now, having beaten Galway, Wexford, and now Tipp in the last 3 NACB finals. Tipp: J. Logue, D. Buckley, R. O'Donnell, S. McGarr, A. McRedmond, P. Moriarty, C. Dempsey, M. Jordan, K. Kelly, J. Pender, M. Moriarty, S. Moriarty, N. Foyle.